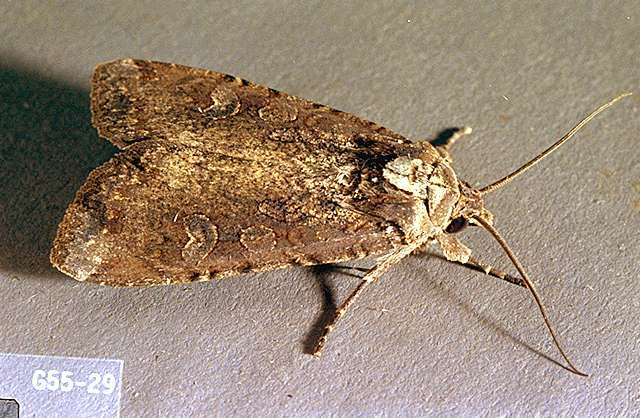 Pest description and crop damage The black cutworm moth is a uniform dark brown with a lighter irregular band near the wing tips and a distinct black dash. The wingspan is 1.5 to 2.12 inches long. Eggs are white at first, later turning brown. Larvae are a uniform gray to nearly black, lighter underneath, ranging from 0.19 inch to 2 inches as they pass through up to nine instars. The pupa is dark brown and about 0.75 inch long. Most feeding is at ground level at night, and plants are cut off at ground level. 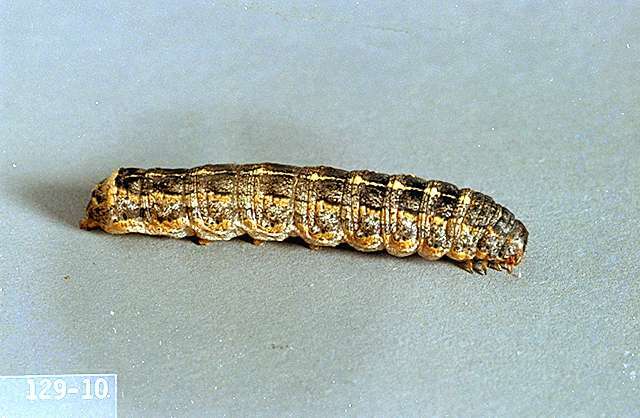 In the Willamette Valley, it is the most damaging cutworm species to vegetable crops. 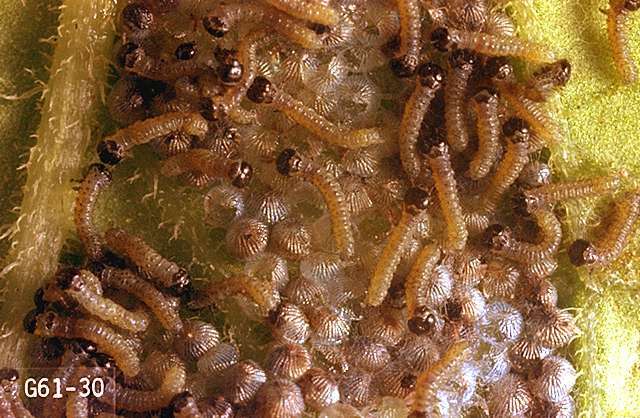 The last, largest instar does by far the most feeding, though middle instars can cut down seedlings. 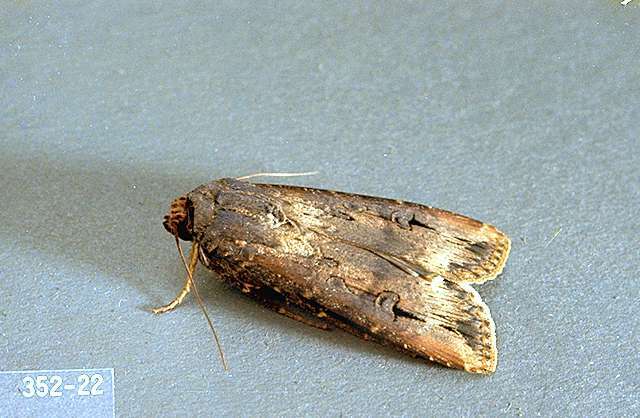 Variegated cutworm moths are about 1 inch long with a wingspan of 1.25 to 2 inches. They vary widely in color. Eggs are white to dull or off-white and ribbed. They generally are deposited in massed rows on crop foliage but frequently are on weeds. Larvae are brownish gray to grayish black, up to 1.75 inches long when fully grown. Pupae are mahogany brown and about 0.75 inch long. The variegated cutworm feeds readily on a wide variety of crops and climbs into the host plant to feed. Cutworms are most active and cause the most damage during spring and early summer. Apply any one of these materials to the soil surface at first sign of cutworm activity. Consult label. Minimum preharvest interval (PHI) varies with crop. Difficult to control. plant-derived essential oils (rosemary, peppermint etc. )-These have some efficacy against lepidopteran larvae. Some formulations are OMRI-listed for organic use. beta-cyfluthrin (Baythroid XL) at 0.007 to 0.013 lb ai/a. PHI 0 days. REI 12 hr. Retreatment interval 7 days. Do not exceed 0.1 lb ai/a. bifenthrin (Brigade 2EC) at 0.033 to 0.1 lb ai/a. PHI 7 days. REI 12 hr. Retreatment interval 7 days. Do not exceed 0.4 lb ai/a per season. bifenthrin/imidacloprid (Brigadier) at 0.06 to 0.095 lb ai/a. PHI 7 days. REI 12 hr. Retreatment interval 7 days. Limit 5 treatments after bloom. Do not exceed 0.24 lb ai/a imidacloprid and 0.5 lb ai/a bifenthrin. bifenthrin/zeta-cypermethrin (Hero) at 0.04 to 0.1 lb ai/a. PHI 7 days. REI 12 hr. Retreatment interval 7 days. Do not exceed 0.45 lb ai/a per season. carbaryl (Sevin 5 Bait) at 2 lb ai/a as granule. PHI 14 days. REI 12 hr. Retreatment interval 7 days. Limit 3 treatments. Do not exceed 6 lb ai/a per season. chlorpyrfos (Lorsban Advanced) at 2.11 lb ai/a soil applied. REI 24 hr. Chromobacterium subtsugae (Grandevo) at 0.3 to 0.9 lb ai/a per 100 gal. PHI 0 days. REI 4 hr. OMRI-listed for organic use. cyfluthrin (Tombstone) at 0.013 to 0.025 lb ai/a. PHI 0 days. REI 12 hr. Retreatment interval 7 days. Do not exceed 0.2 lb ai/a. cypermethrin (Holster) at 0.05 to 0.1 lb ai/a. PHI 1 day. REI 12 hr. Retreatment interval 7 days. Do not exceed 0.4 lb ai/a per season. diazinon (Diazinon 50W) at 2 to 4 lb ai/a. Broadcast just before planting and immediately incorporate into the soil. REI 4 days. One soil treatment per season.